Researchers at Hospital for Special Surgery (HSS) have discovered that a type of immune cell known as Langerhans appears to play an important role in photosensitivity, an immune system reaction to sunlight that can trigger severe skin rashes. The study, a collaborative effort among scientists at HSS and other institutions nationwide, appeared online in the journal, Science Translational Medicine on August 15. Photosensitivity, in which even ambient exposure to the sun's ultraviolet rays can result in a blistering or scaly, thickened skin rash, affects 30 to 60 percent of people with lupus. It can also occur in individuals with other autoimmune diseases or dermatologic conditions. The skin lesions can be disfiguring, contributing to feelings of low self-worth and depression. In lupus patients, photosensitivity is also associated with systemic disease flare-ups. 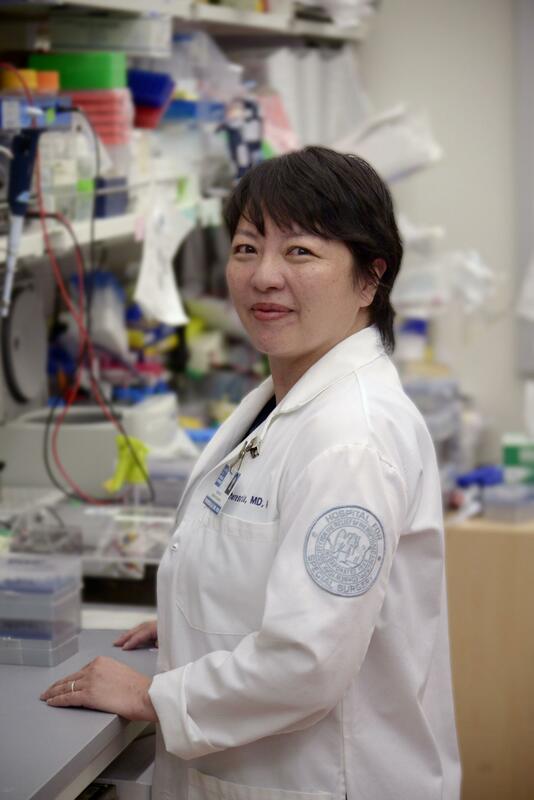 "Photosensitivity is poorly understood, and we launched the study to gain insight into the underlying cause," explained Theresa Lu, MD, PhD, lead investigator and associate scientist in the Autoimmunity and Inflammation Program at HSS. "Current treatment consists mainly of sun avoidance and sunscreen to prevent the skin rash. A better understanding of the cellular mechanisms involved in photosensitivity could lead to improved treatment." Dr. Lu and colleagues zeroed in on Langerhans cells (LCs), immune cells that sit in the epidermis, the top layer of the skin, hypothesizing that these cells might have a protective function. Cells in the top layer of the skin known as keratinocytes depend on epidermal growth factor family (EGF) cytokines to remain healthy. When LCs are functioning well, they express a molecule called ADAM17 that is activated when exposed to UV light. ADAM17 is responsible for activating cytokines in the EGF family. "Our laboratory study found that Langerhans cells played an important role in protecting the skin from UV light-induced injury. In models of lupus, LCs express less of the ADAM17 molecule, so they are less effective at activating the EGF family cytokines that play a role in protecting the skin. In other words, the cellular pathway is not working as it should," Dr. Lu explained. Dr. Lu notes that the study uncovered an important new function for Langerhans cells. "We knew that they were immune cells that protect against infection, so this is a new role for them in terms of protecting the health of the skin exposed to UV light," she explained. "We're excited about these findings because they provide new insight into photosensitivity, and we now have a potential pathway of molecules and cells to target for a possible treatment down the road." She said her laboratory will continue to conduct research to further elucidate the biological underpinnings of photosensitivity and determine why lupus patients are susceptible to the condition. HSS is the world's leading academic medical center focused on musculoskeletal health. At its core is Hospital for Special Surgery, nationally ranked No. 1 in orthopedics (for the eighth consecutive year) and No. 3 in rheumatology by U.S. News & World Report (2017-2018). Founded in 1863, the Hospital has one of the lowest infection rates in the country and was the first in New York State to receive Magnet Recognition for Excellence in Nursing Service from the American Nurses Credentialing Center four consecutive times. The global standard total knee replacement was developed at HSS in 1969. An affiliate of Weill Cornell Medical College, HSS has a main campus in New York City and facilities in New Jersey, Connecticut and in the Long Island and Westchester County regions of New York State. In 2017 HSS provided care to 135,000 patients and performed more than 32,000 surgical procedures. People from all 50 U.S. states and 80 countries travelled to receive care at HSS. In addition to patient care, HSS leads the field in research, innovation and education. The HSS Research Institute comprises 20 laboratories and 300 staff members focused on leading the advancement of musculoskeletal health through prevention of degeneration, tissue repair and tissue regeneration. The HSS Global Innovation Institute was formed in 2016 to realize the potential of new drugs, therapeutics and devices. The culture of innovation is accelerating at HSS as 130 new idea submissions were made to the Global Innovation Institute in 2017 (almost 3x the submissions in 2015). The HSS Education Institute is the world's leading provider of education on the topic on musculoskeletal health, with its online learning platform offering more than 600 courses to more than 21,000 medical professional members worldwide. Through HSS Global Ventures, the institution is collaborating with medical centers and other organizations to advance the quality and value of musculoskeletal care and to make world-class HSS care more widely accessible nationally and internationally.